I was in your Time Span workshop where you spoke about the 4 Absolutes required for success. I think I have always known about #3, interest, passion (value) for the work. It speaks to a candidates attitude about the work. In some cases, that is more important than skill (which, over time, I can teach anyway). But, here is my struggle. How do you interview for interest or passion for the work. This is a dilemma faced by most hiring managers. Intuitively, you know how important this is, but you struggle on how to collect data related to interest and passion. The reason is – you can’t. Interest and passion lives inside a person’s head and you know my warning – Don’t play amateur psychologist. Stay out of people’s heads. But, as a manager, you are an expert at observing behavior. Translate the attitude into behavior with this magic question – How does a person with interest or passion for this work behave? Then interview for those behaviors. I also look for related attitudes like pride, importance and challenge? Tell me about a project you are most proud of? Who was on your project team? What were the characteristics of the project that made you proud of your accomplishment? Tell me about a project that was important to your professional growth? What were the characteristics of the project that made this important to your professional growth? Tell me about a project that you found professionally challenging? What were the characteristics of the project that made it professionally challenging? The magic question is courtesy of Barry Shamis, my hero in the behavioral interview. This entry was posted in Hiring Talent and tagged hiring talent, interest, passion, value for the work on December 14, 2016 by Tom Foster. How do you interview for interest and passion, value for the work at S-II? Before we can interview for interest and passion, we have to define the work. It’s always about the work. Most S-II roles are coordinating, supervisory roles, using checklists, schedules and short meetings. The role could be project management, coordinating and first-line management. Longest time span goals and objectives would be short term, three months, six months, nine months, up to 12 months or one year. Learning would include documented experience, written procedures, articles, research, books and conversations with colleagues. Problem solving would include best practices, matching problems with proven (documented) solutions. Value-add to the organization is accuracy (quality), completeness and timeliness. It is the role at S-II to make sure production gets done, meets spec, totally finished and on deadline. Managerial roles at S-II are accountable for the output of the team. How does it feel to put a checklist together, and then hour by hour through the day, check things off as they are completed? What is the satisfaction, at the end of the day, to have a checkmark in every box? Some people get their daily juice from checklists. Some accountants get their daily juice from a bank reconciliation that balances to the penny. Interest and passion comes from work on which we place a high value. If we place a high value on the work, it is likely we will be interested and passionate about that work. Here are some questions about interest and passion for the work at S-II. Tell me about a project you were accountable for, that had several steps in it that you had to coordinate and keep track of? How was the project communicated to you by your manager? Step me through how the project was organized, step by step? How did you keep track of the steps? How did you communicate the steps to the team? At any point in the project, how could you tell the progress of the project? During the project, did any of the steps change? When the project was totally completed, how did you communicate that to your manager? When the project was totally completed, how did you communicate that to the team? How were records about that project kept? stored? archived? or discarded? Tell me about another project that had several steps in it that you had to coordinate and keep track of? Each of these questions asks for a specific piece of data about the candidate. And though we are trying to find out about an attitude or feeling, the questions are still laser focused on the work. This entry was posted in Hiring Talent and tagged hiring talent, interest, interview, passion, work on September 9, 2016 by Tom Foster. You say in your book that there are four absolutes for success in a role, and that it doesn’t matter what discipline. How do you interview for interest and passion? Interest, or passion (for the work) depends on the value we place on that work. If we place a high value on a type of work, we will likely be interested in or passionate about that work. If we place a low value on the work, it is likely we will NOT be interested or passionate about the work. So, stratum by stratum level of work, let’s start with Stratum I (S-I). Most S-I roles are production related, using real tools or machinery. The role could be clerical, mechanical or technical. Goals and objectives would be short term, one day, one week, one month, up to three months. Learning would mostly be learning-by-doing (kinesthetic). Problem solving would mostly be trial and error (and high S-I would be highly skilled at trial and error problem solving, rapid trial and error). Value-add to the organization is quality (product quality, service delivery). I was talking to a finish carpenter. I asked him the difference between quality workmanship and shoddy workmanship? This was just a casual conversation, but my carpenter friend was dead serious about the quality of his finish work. In an interview, this understanding would guide my questions. I want to ask you about three projects. And, they have to be real projects. First project, you had a lot of time, there was plenty of budget and schedule to go slow and pay attention to detail. Second project, you had to keep up a reasonable pace with a firm deadline. Third project, you were under the gun to knock the project out and could take any reasonable shortcut you could muster. First project, plenty of budget and schedule to go slow, take your time, pay attention to detail. What was the project? How was the budget and schedule communicated to you for the project? How did you understand the schedule and detail required? What details were most important on this project? What additional preparation was required? What special tools or techniques were involved? How much extra time did it take? What were the visible results, different from other projects? How was this work inspected by your manager, or the customer? On this project, what were you most proud of? Note, these same questions could be asked about many different kinds of roles working on many different kinds of projects. Second project, standard production pace, nothing special. What was the project? How was the budget and schedule communicated to you for this project? How did you understand the schedule and detail required, different from the first project? What details were required, what details were less important on this project? What preparation was required, different from the preparation on the first project? What special tools or techniques were involved, different from the first project? How much time was saved by foregoing some of the detail? What were the visible results, different from the first project? How was this work inspected (reviewed) by your manager? On this project, what decisions did you personally have to make related to pace and quality? Decision making as S-I level of work typically revolves around pace and quality. As you ask about these decisions, you will see the candidate’s attitude about the work, the value the candidate places on the work. Third project, one where time was of the essence. You still had to meet the quality spec, but you had to really hustle to meet the deadline. What was the project? How was the budget and schedule communicated to you for this project? How did you understand the schedule and detail required, different from the first two projects? What details were required to meet the minimum quality standard, what details were less important on this project? What preparation was required, different from the preparation on the first two projects? What special tools or techniques were involved, different from the first two projects? What were the visible results of the allowed shortcuts, different from the first two projects? This entry was posted in Hiring Talent and tagged four absolutes, hiring manager, hiring talent, interest, value for the work on September 7, 2016 by Tom Foster. Will I Even Show Up? In your workshop on Time Span, you mention interest and passion as a critical role requirement. That sounds nice, but what does it mean? Indeed, interest and passion have a kumbaya appearance in the midst of more tangible candidate characteristics. So, what is it, related to work, that we have interest in and passion for? You know me well enough, this is not a casual metaphorical discussion. We have interest in, and passion for, work on which we place a high value. If we place a high value on the work, it is likely we will have interest and passion for it. If we place a low value on the work, it is likely we will not be interested. Low value means we will not bring our highest level of capability. We will most likely only do what is minimally necessary. My wife places a high value on a type of work called “back yard gardening.” You can imagine that my home in Florida is a veritable jungle of exotic plants and butterflies. Why? Because she place a high value on that type of work. I, on the other hand, place a low value on a type of work called “back yard gardening.” So, if I am ever summoned to the back yard to complete a task assignment, will I even show up? Of course, I will show up, I am married, but I will only do what is minimally necessary and then I disappear. So, think about the work in the roles you have for your team. Think about the work you have for yourself. What are the problems that have to be solved? What are the decisions that have to be made? Interest and passion come from value for the work. This entry was posted in Accountability, Hiring Talent and tagged hiring talent, interest, passion, value for the work on August 17, 2016 by Tom Foster. Joel was not shaking, but he was certainly shaken. “Being new to management is tough. No one prepared you for this, they just promoted you and expected you to figure it out,” I replied. “And what if I don’t figure it out?” Joel asked. This entry was posted in Accountability and tagged interest, manager, passion, role, supervisor on July 29, 2013 by Tom Foster. How do you un-do some internal promotions that probably shouldn’t have happened? The person is just not effective in their new Stratum III role? And yet, is under performing in his role. Put that list against the four factors and I arrive at capability mis-matched for the role. To do a thorough inspection, I would examine each of the Key Result Areas in the role to see where the underperformance occurs. It is likely there are parts of the role that are done well, and parts where we observe underperformance. The mis-match is likely to occur on those longest Time Span task assignments. In your question, you describe a Stratum III role. I would examine each of the KRAs and task assignments to see which is the culprit and modify that specific task assignment. The modification might be to break the longer task into a series of shorter tasks with more oversight, or to shift an analytic step to another resource. All of this can be avoided by assigning project work to team members BEFORE they receive promotions. Successful completion, evidence is what I look for, not hopes and promises. 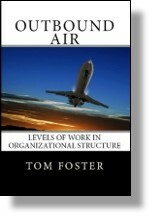 This entry was posted in Time Span and tagged capability, habits, interest, internal promotion, passion, project-management, research, role, role description, skill, stratum on March 7, 2012 by Tom Foster.